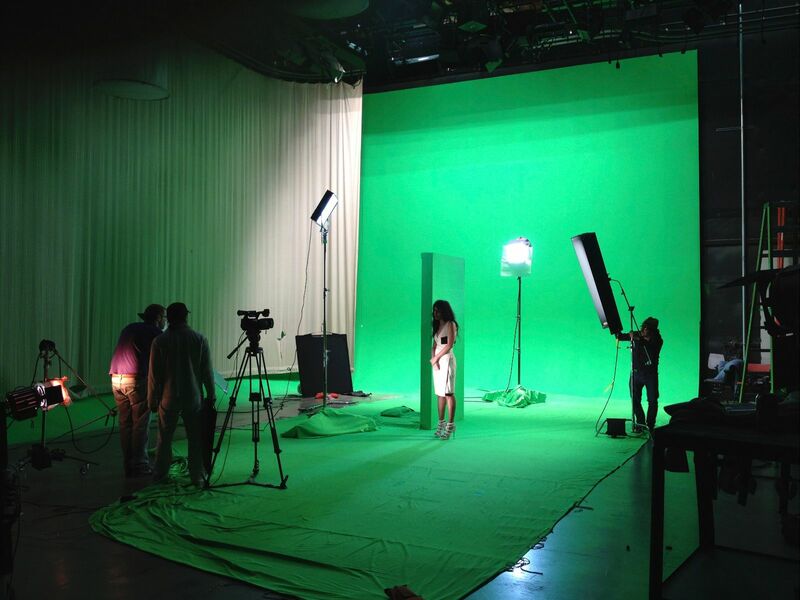 From explosions, car chases and outer space, the use of green screen in production can be an excellent way to create a visual world. However, this task is hardly an easy one; it requires meticulous detail and technical knowledge to bring these stories and environments to life. For Professors Mike Fink and Peter Sollett, teaching students how to direct with a green screen and advanced visual effects while creating a world grounded in storytelling is top priority. Of the detail work that goes into designing a visual landscape, Fink notes, “All of those things have to be anticipated, as well as all of the things that come from live-action photography and everything on the set. [Through this course,] in the end, students gain a real appreciation for the granularity of the thinking that goes in to putting these kinds of sequences and shots together. The class is CTPR 599 “Directing in a Virtual World,” which blends the concepts of directing and creating a story with filming in front of a green screen or through the creation of shots that rely heavily on visual effects. It is a graduate level course that is open to third and fourth year undergrads with a particular emphasis in animation/DADA and production.